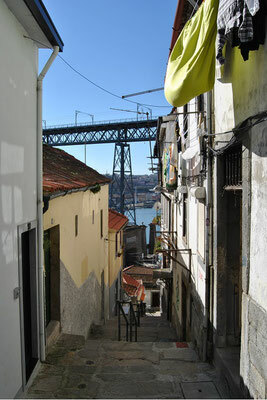 From 1991 to 1993 J.K. Rowling lived in Porto. The idea to create the novel character Harry Potter was already born during this time. In Porto the story was brought more and more to life until the first Harry Potter novel was ready in 1995 and published in 1997. 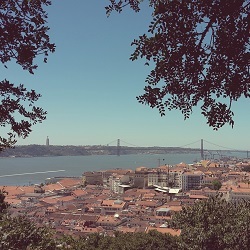 The British author confirmed that she was inspired by Porto at some point. 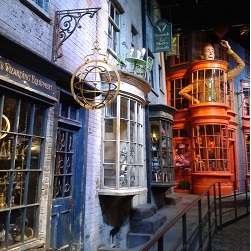 Rumour has it that the following places (and man) had an influence at the Harry Potter books. 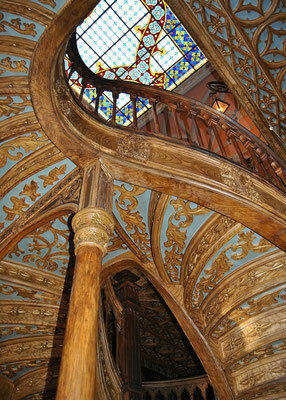 Livraria Lello is not only voted one of the most beautiful book stores of the world, it is also one of the most popular tourist attractions for Harry Potter fans in Porto. 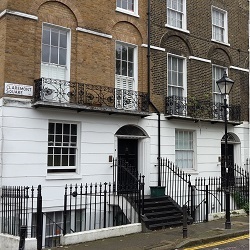 The legend tells this book store gave J.K. Rowling the idea of the moving stairs in Hogwarts; an important detail in Harry Potter and the philosopher´s stone. Due to the stairs Harry, Ron and Hermione accidently walk into the forbidden corridor where they see Fluffy, a dangerous dog with 3 heads. There Hermione recognizes the trapdoor guarded by Fluffy which leads to the stone. In the end Harry and his friends can protect the stone which contains the immortality elixir from Voldemord. 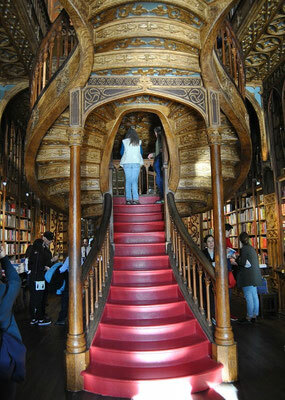 Moreover, Livraria Lello looks a little bit like Flourish & Blotts - a magical book store, which is located in Diagon Alley. Because Livraria Lello is so popular that only tourist come here to make photos but no clients to buy books the admission fee is 4€. When buying a book for at least 15€, you will get the fee back. There are not only many Portuguese books but also many English ones. Three houses left to the store there is another store that sells the tickets. There are also lockers to store your bags. In winter the best time to visit the book store is in the afternoon because in the morning there was always a small queue but in the afternoon you could just walk in. It is also well worth visiting the beautiful book store with the curved stairways, ornate wooden book shelves and the colourful glass ceiling if you are no fan of Harry Potter. The magnificent fountain Fonte dos Leões is located close to the book store Livraria Lello at a beautiful square, which is called Praça dos Leões. The fountain was built in the 19th Century. 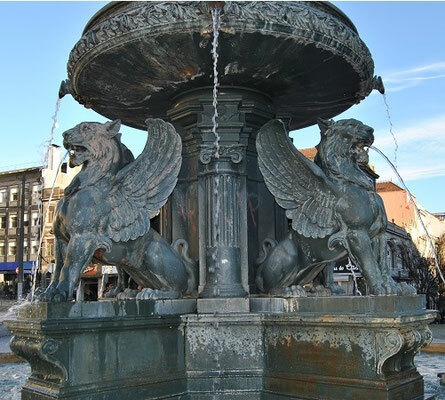 It is alleged that the four winged lion statues gave J.K. Rowling the inspiration to the Gryffindor symbol (also a lion). 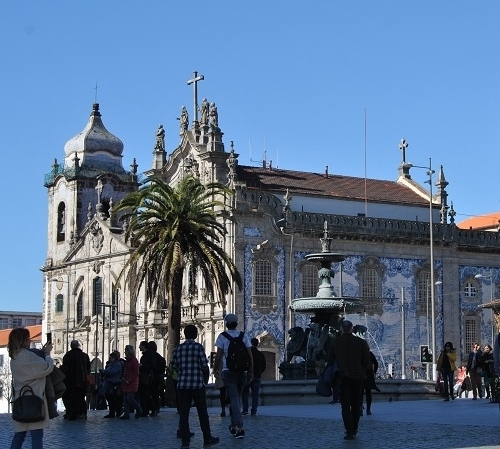 Also non Harry Potter fans have to visit this place because the beautiful church Igreja do Carmo is located here. 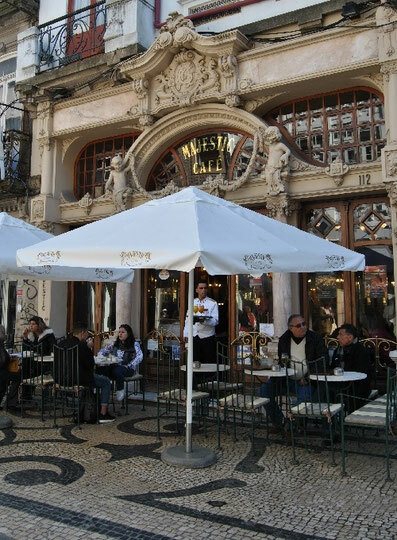 Café Majestic is one of the oldest cafés in Porto. Rumour has it that this café was the favourite one of J.K. Rowling when living in Porto. Whenever she did not teach English to some students, she was here to write the first Harry Potter book. 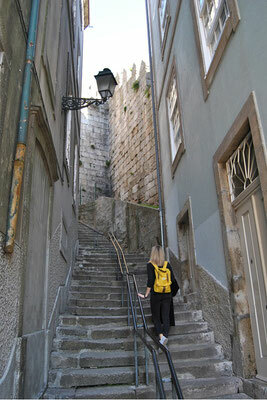 The café is located at Rua de Santa Catarina (number 112). 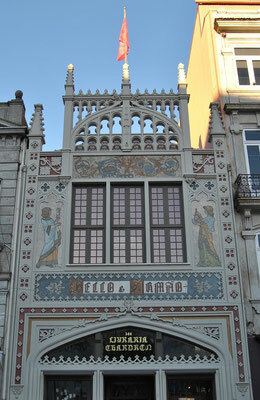 It was built in 1921 in the Arte Nova style. The interior design is characterized by great chandelier, beautiful stucco ceilings, huge wall mirrors, small tables with marble table plates and ornate wooden chairs. To be honest we didn´t stop there for a coffee break because the pompous café looked too touristic. Furthermore, we read that the prices are much higher than in other nice cafés. For a really good coffee I can recommend the café "Combi Coffee" (Rua Morgado Mateus no. 29) which is only 550 meters away from Café Majestic. 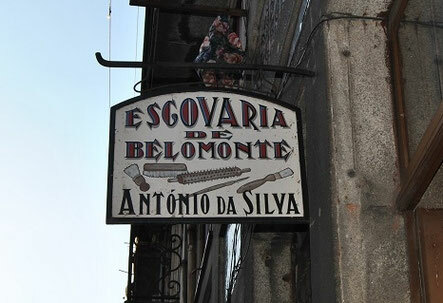 The traditional handicraft business Escovaria de Belomonte can be found in the street Rua de Belomonte. Since 1927 different products like brushes and brooms are made here. Everyone who is still waiting for his letter from Hogwarts will of course see a connection between this store, the Harry Potter novels and Harry´s favourite vehicles, a flying broomstick. We also passed by but unfortunately could not find a Nimbus 2000. At the University of Porto students were uniforms with black capes like the students of Hogwarts. 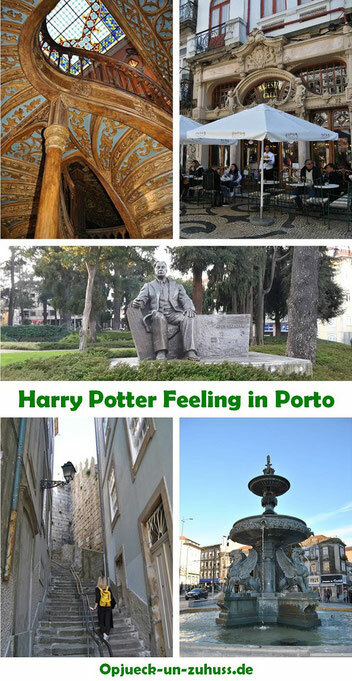 Therefore Portuguese Harry Potter fans are sure that J.K. Rowling got the idea from Porto´s students. Although I read on some blogs that you can see the students in their capes all over the city, we didn´t see them. In 1933 António de Oliveira Salazar started a conservative authoritarian dictatorship in Portugal. In a public tweet J.K. Rowling confirmed that the novel character Salazar Slytherin was named by the former president of Portugal. Additionally to Helga Hufflepuff, Godric Gryffindor and Rowena Ravenclaw, Salazar Slytherin was one of the founders of Hogwarts. Because the other three didn´t agree to teach students with pure-blood only, he built the chamber of secrets and disappeared. In this chamber was a dangerous basilisk that should kill wizards ad witches with muggle parents. Many years the chamber could not be found until in the second book "Harry Potter and the chamber of secrets" Harry and Ron found the entrance. Of course at the end of the book, Harry could kill the monster and save Ginny. Although the most rumors are not confirmed by J.K. Rowling, it is nice to walk through Porto and visit all these places, if you are a Harry Potter fan. This is an awesome guide! I honestly had no idea about some of these places, like the Salazar statue! 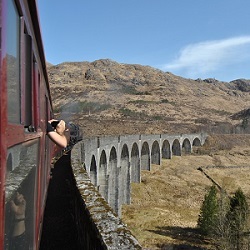 I would love to go here and see what inspired JK Rowling. 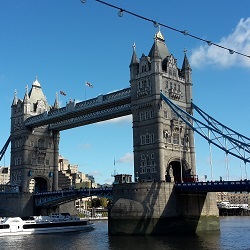 I think it's amazing how authors are influenced by the sights around them for their work. Maybe they didn't tell us everything about Harry Potter ... :-) Your pictures and your article are great!! Oh my gosh that winding staircase! So so so beautiful! I have never been a Potter head! But after reading this may be I should give it a try. Your pictures are amazing. OMG this post it totally pinned! 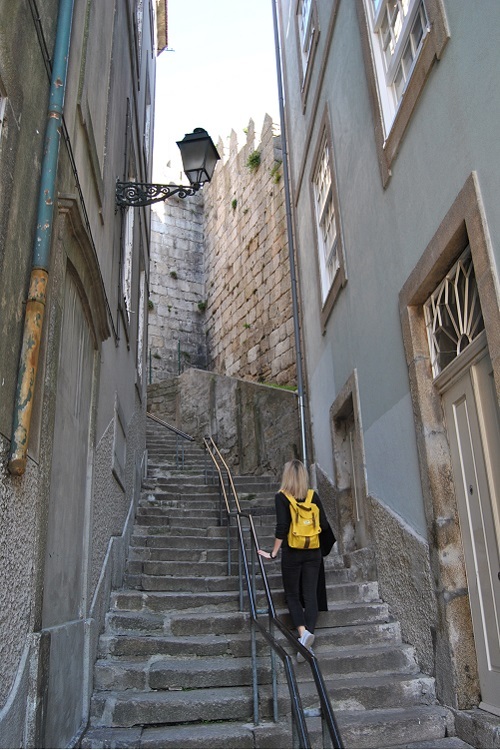 I freaking love Harry Potter and I absolutely love Portugal and want to go back and explore more. This is more of a reason to go! Thank you so so much for making this post! This guide is absolutely amazing. 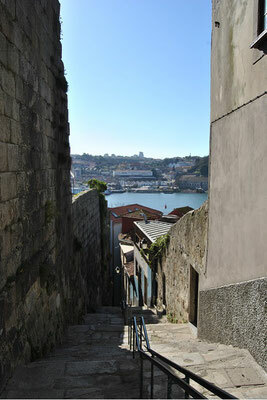 We are thinking of heading to Porto this year. I'm going to pin it and keep for further reference. Porto looks so magical and it isn't just the Harry Potter part of it!